Using Child Themes in WordPress is a great way to modify an existing theme, however the CSS @import directive is slower than it has to be, so you should try and avoid it. Here’s why. If it takes 200ms to load the child theme’s stylesheet, and 200ms to load the parent theme’s CSS, a modern web browser should take approximately 200ms to load both of them, because modern browsers load assets in parallel. The browser must download, parse, and execute first.css before it is able to discover that it needs to download second.css. And we don’t need to re-declare dependencies because the child theme’s functions.php is loaded before the parent theme’s. Unless, of course, the parent theme uses a different action priority, in which case we should just match it. I’ve seen tens, maybe hundreds of different plugins, all with different approaches at creating social profile links in WordPress themes via widgets, menus, shortcodes, and “insert this piece of PHP code in footer.php” and whatnot. A few days ago I stumbled on what I think is the right way. 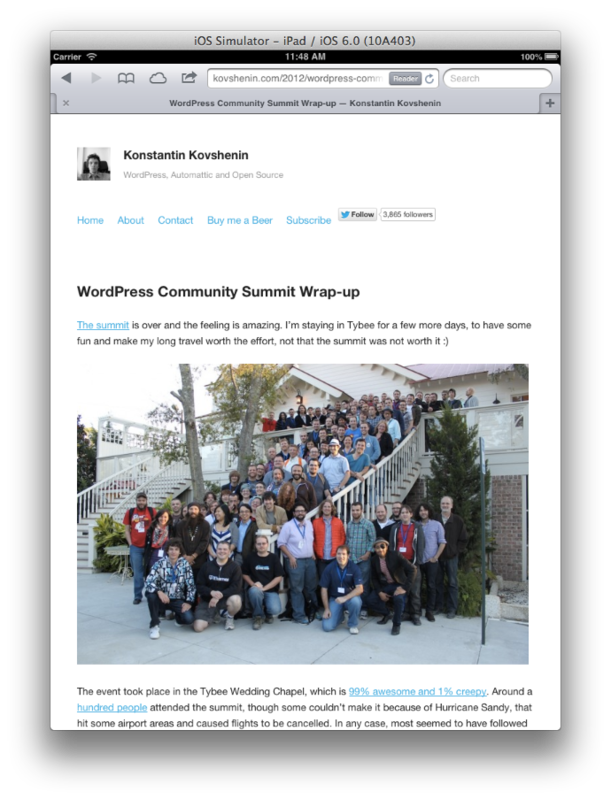 I gave this talk at WordCamp Norway 2013. 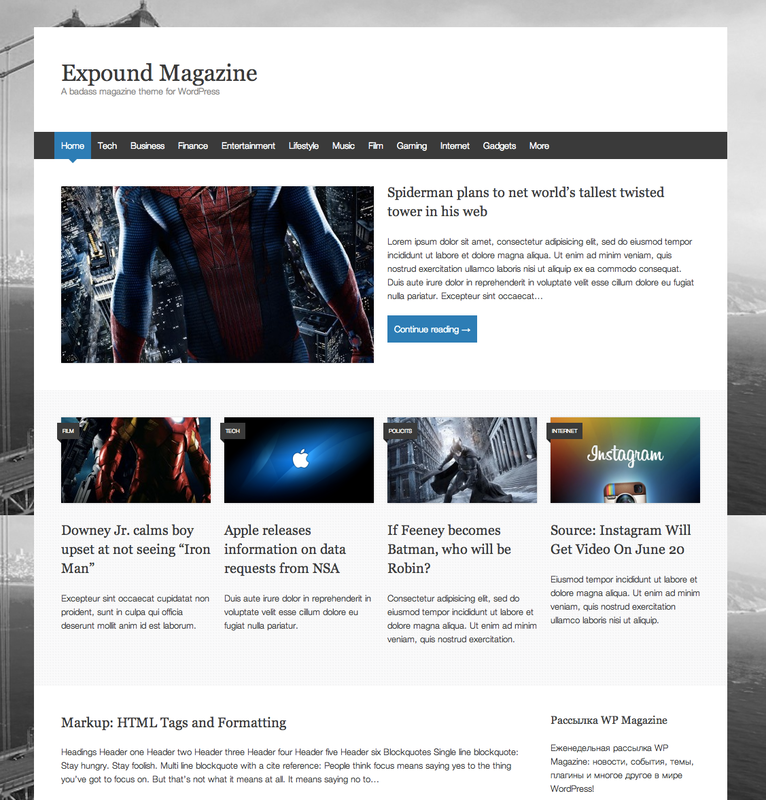 It covers several tips and tricks that will make you a better theme developer. 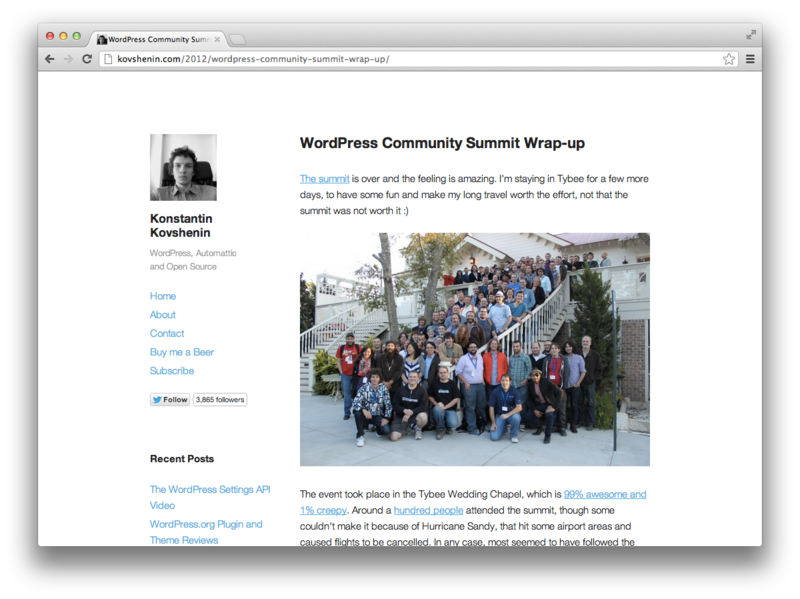 I’m pleased to announce that Publish is now available for download in the WordPress.org themes directory. Publish is a theme I’ve been working on for quite a while, started back last year and then released to GitHub in February this year. 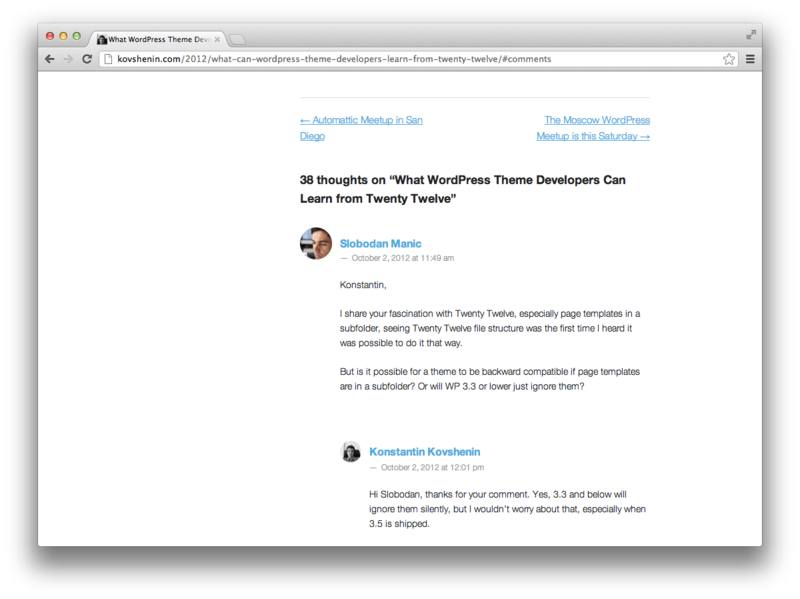 When I started contributing to _s, I did a complete revamp of the theme, but kept the main intent — a minimal blogging theme with focus on the content. 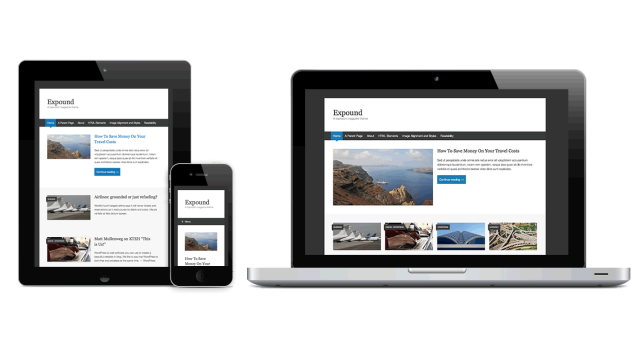 Publish is ideal for single-author blogs, but supports multi-author blogs too. To change the “logo” Gravatar, you’ll need to change the main administrator e-mail address via Settings – General. Publish supports navigation menus, has a sidebar for your widgets, implements threaded comments, has support for various post formats and the sticky post. 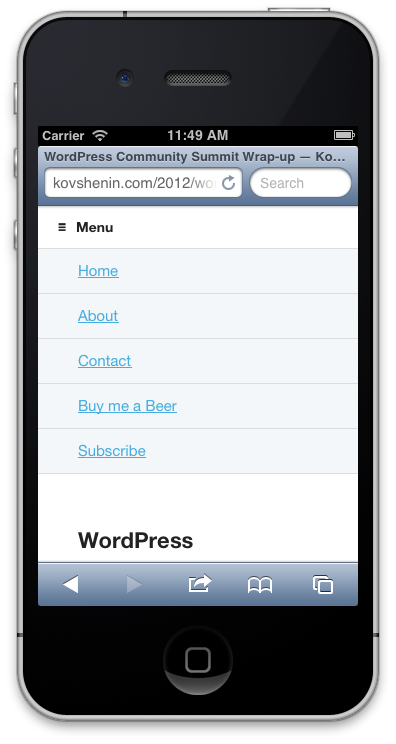 It has also got a responsive layout, with a drop-down menu for mobile devices. Other features, including post thumbnails, are on their way, so hang in there, or submit a patch! Give it a spin and let me know what you think. Since theme reviews are live on WordPress.org, I’d really appreciate one, whether good or bad. If you would like to contribute to Publish, feel free to open pull requests or issues on GitHub. 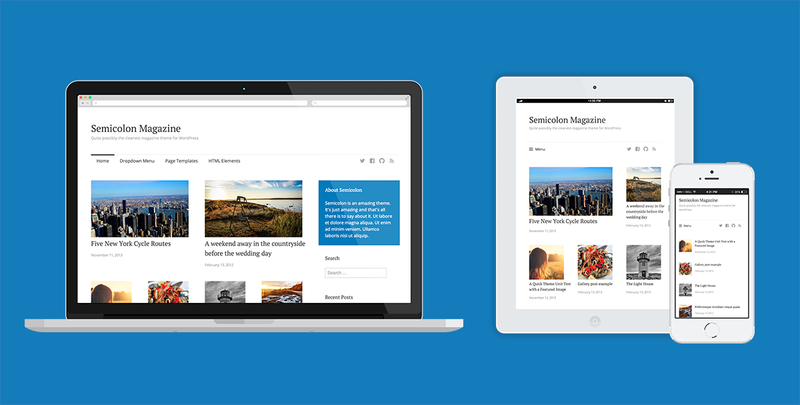 We’ve all been waiting for the new default theme for WordPress, and it has finally arrived. 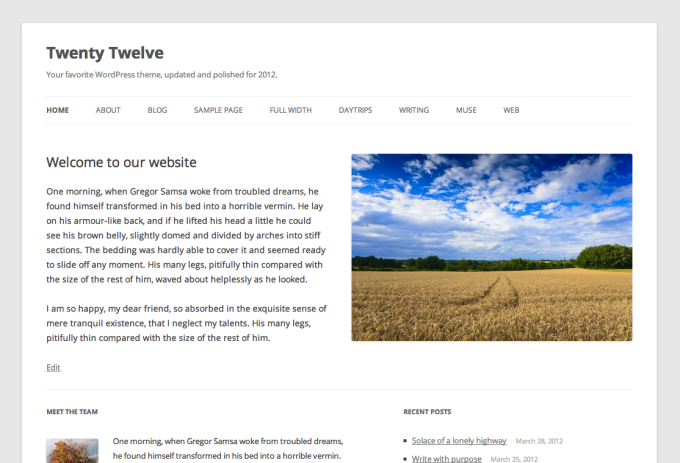 Without a doubt, Twenty Twelve is one of the best themes I’ve ever played with. It’s so simple, clean, good-looking and filled with so much awesomeness inside. I’m sure that by now you have downloaded the theme, or at least checked out the demo. In this short review I’d like to point out the things that make Twenty Twelve so awesome, and what you can learn from it. If you find other gems worth mentioning, don’t forget to share them by posting a comment.